which is anchored in the heart of Trivandrum, inside the East Fort. This amazing temple was constructed by the King of Travancore in the 1733 AD in Dravadian style of architecture with paintings and stone carvings adoring the temple. The demonstration of this seven storied gopuramin the crystal clear water of the adjacent holy tank which grabs attention of every visitor’s here. In the sects of Tamil Saints this temple is described among the 108 sacred places of Lord Vishnu in the entire universe. Located central the East Fort in Thiruvananthapuram, the capital city of the State of Kerala in India is the Sree Padmanabha Swamy temple committed to Lord Vishnu. This temple is a mixture of the Kerala and Dravidian styles of architecture. 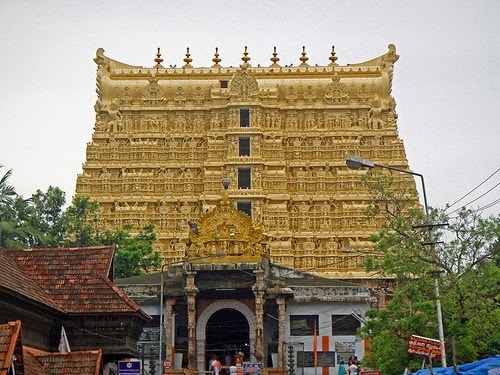 The history of Sree Padmanabhaswamy Temple dates back to 8th century. It is one of the 108 holy Vishnu temples or Divya Desams in India. Divya Desams are the holiest abodes of the Lord Vishnu that are mentioned in the works of the Tamil Azhvars (saints). The prime shrine of this temple is Lord Vishnu, buckled on Anantha, the hooded Serpent. Marthanda Varma, the acclaimed a part of Travancore kings did a major renovation to the temple and it resulted in the present day form of the Sree Padmanabhaswamy temple. It was Marthanda Varma who introduced the Murajapam and Bhadra Deepam festivals in the temple. Murajapam, which truly means continuous chanting of prayers, is still conducted in the temple already in six years. In 1750, Marthanda Varma dedicated the kingdom of Travancore to Lord Padmanabha. Marthanda Varma vowed that the royal family will rule the state on account of Lord and he and his birth would serve the Kingdom as Padmanabha Dasa or the Servant of Lord Padmanabha. Since again the name of every Travancore King was preceded by the appellation Padmanabha Dasa. The donation of the commonwealth of Travancore to Padmanabhaswamy was accepted as Thripadidanam. The accepted arch of the Travancore Royal Family is Uthradom Thirunal Marthanda Varma. TThe temple architectonics stands out for its plan in rock and bronze. The temple interiors are adorned by admirable paintings and murals. Some of them are that of the life-size images of Lord Vishnu in the collapsed posture, Narasimha Swamy (half-lion, half man personification of Lord Vishnu), Lord Ganapati and Gaja Lakshmi. The temple has a dhwaja stamba (flag post) that is about 80 ft top and is covered with gold plated copper sheets. The temple as well has some absorbing structural appearance in the form of Bali Peeda Mandapam and Mukha Mandapam. These are halls, busy with admirable sculptures of assorted Hindu deities. Another structure that captures absorption actuality is the Navagraha Mandapa the beam of which displays the navagrahas (the nine planets). Please note that the temple worship timings are subject to change during festival season, so before you visit the temple please confirm the timings. Only Hindus are permitted inside the temple. There is a very firm dress code that needs to be followed while entering the temple. Men charge to wear mundu or dhoti (worn about the waist and coming down up to the heels) and should not wild shirts of any kind. Women need to wear sari, mundum neriyathum (set-mundu), brim and blouse, or half sari. You can as well get ‘Dhotis’ on rent on the entrance of the temple. Recently the temple authorities as well allow Dhotis over Pants or Churidar to avoid inconvenience to the devotees. Thiruvananthapuram Central Railway Station is about 1 km away. You should take a Auto towards the temple. There is no need for picking Taxi to reach the temple. Only if you want to travel to other places, you should take taxi. Thiruvananthapuram International Airport is about 6 km away, from here onwards you can travel in a Local Bus, Auto or Taxi towards East Fort (Kizhakkekotta). From East Fort it is only walk able distance towards the Sree Padmanabha Swami Temple. The Bus Stand is located at Thampanoor in Trivandrum and from there the temple is only 1 km away. Take an Auto and you can comfortably reach the temple by paying an auto fare about Rs 15 to 20.